Park Circle Cares is a South Carolina 501 (c)(3) non profit organization. We conduct mass food distributions throughout the Charleston, SC area to assist families and neighborhoods that suffer from food insecurity. We’re nothing without our volunteers. Really, it’s all about everyday people like you. Sure, it’s hot, dirty work, but it’s so rewarding. You’ll walk away knowing you’ve helped someone eat. We welcome people of all ages and walks of life. Chances are, either you or someone you know has suffered from food insecurity. Ever live paycheck to paycheck? Sometimes we all need a little break. 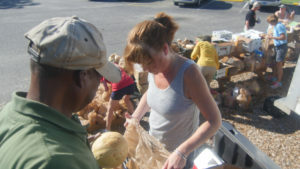 PCC consists of numerous volunteers who are the backbone of any of our mass food distributions. However, the administration of PCC is comprised of three partners. Orly brings over 20 years of quality assurance and project management experience to this organization. She has had a passion for human rights since she was in law school. Not only does she make the administration and financial department run smoothly, she’s the first to carry something on a mass food distribution. COO Chris Schaper working hard. Chris brings the heart and soul to Park Circle Cares. After working for the Food Bank for years, Chris knows the streets. He has helped orchestrate years of mass food distributions, and knows where food is really needed. 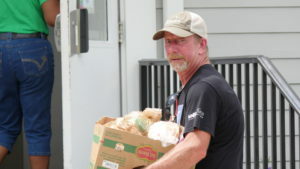 With over twenty years of media experience, Working mass food distributions reminds him of his old Boy Scout days where helping others and being polite is just a given.